This is a a diagram of the Solar System. It was released shortly before the International Astronomical Union made its final decision about whether Pluto should be a planet or not. In the end, they decided that Pluto is not a planet. But for a few days, it was possible that there would be 11 planets in the Solar System, including Pluto, Eris and the asteroid Ceres. 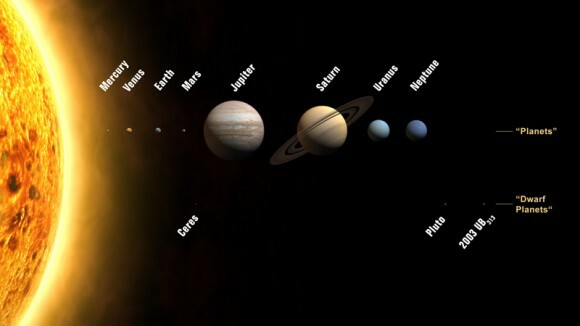 This image of the Solar System shows them all with the Sun. 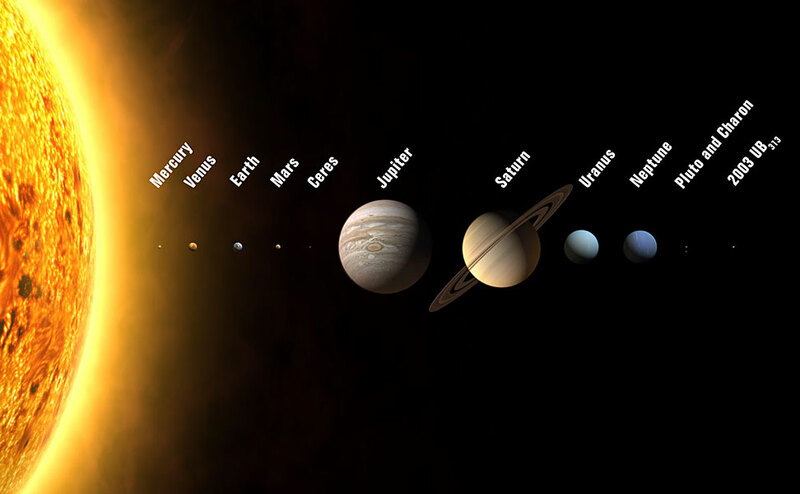 This is a montage photo of the Solar System, with a picture of a Sun and all the planets, as well as all the moons in the Solar System. This lets you see just how many objects there really are in the Solar System. This is another montage of the planets, dwarf planets, comets and asteroids in the Solar System. It’s one of the older Solar System pictures that we’ve seen. Here’s a Solar System image with all the planets correctly categorized. In this, we can see a picture of Pluto, Ceres and Eris are correctly designated as dwarf planets. Want more images of planets? Here are some pictures of Mars, pictures of Venus, pictures of Saturn, pictures of Pluto, and pictures of Jupiter. Here’s an article about a 3D Solar System. One of the best resources for photographs of the Solar System is NASA’s Planetary Photojournal. You can also check out Hubble’s photographs of the Solar System. Is there any noticeable changes in the behavior of how the planets rotate or out of line or lining up in single file? Very interesting… There should be more dwarf planets. Haumea and Makemake. i love learning about the solar sytem! !that’s why i came to this website. Previous PostPrevious What Are YOU Doing for the International Year of Astronomy?